Web 2.0 is a blessing and a curse to anyone who's working as a contractor, an artist, a small business owner, or simply out there as an individual. The curse? Well, you can spend too much time having too much fun playing with social networking...or you can have no fun at all setting up or learning the sites. MySpace is a prime example of that: surfing it's fun, building a page with it is NOT. The blessing? Well, if you choose to take the plunge you can hook in to a community of people who are talking about what you want and need to talk about. There's an investment, but considerable rewards...the choice is yours. If you work for a large company, the choice has been made for you and that choice is probably, "NO." Employers as a rule fear Facebook, Twitter, and all their cousins (except maybe for LinkedIn). I've even noticed that one of my best clients, the County of Los Angeles, forbids their 120,000+ employees access to BLOGS due to a recent court case involving harassment in the fire department. That is another downside people are barely starting to grapple with: the new meaning of indiscretion. But this Blog prohibition--what a disaster! Blogs are (aside from being a source of endless, er, self-expression) key sources for breaking news and information. Particularly for people interested in technology, the blog is going to have that little trick or workaround or piece of news you need. It's happening in the arts as well, and also for people involved in crafts (that's crafts in the OLD sense of the word: people who make things of all sorts). And of course Twitter is nothing more than a blog written one thought at a time. Reading them in aggregate can be fascinating: it'll keep you up on everything happening in real time if you're reading the right people. My friend Catheryn Clarke over at TVholic pointed out that Twitter was the best way to track what was going on during the incredible chaos of the Mumbai massacres. Facebook also has that blogging/info function, but perhaps it's better thought of as a large and unruly party. You'll end up talking about all sorts of stuff with a collection of friends from across your personal landscape/timescape. Many people are using Blackberry or IPhone to stay on top of these sites, and I'd add one more: Jott.com is a superb service that allows you to post emails, blogposts, and so on by calling Jott and dictating. It works best with Twitter (or Google Calendar) since there's a time limit...and there's a limit to the skill with which the Jott voice recognition software can translate your utterings into text. So what's it all for? I recently saw a web media consultant go on about this at length. For him, it was all about understanding how the components fit together to help you get in touch with people. Now you may be an artist looking for collaborators and audience, or you may be just a person looking to rebuild their far-flung network of friends, or you may be trying to sell something. All three of those describe me. The formula was intersting...in essence: Twitter, Facebook and all the rest are a party, a place where you go to talk about something (anything at all)...people who are interested in what you're about will follow you "home." Blogs (and websites) are your home: invite people in and give them something! Maybe it's a song or a piece of information or a photo or a little piece of what it is that you do and make. This arrangement of technologies in Web 2.0 is how you get past the circuits and back to that set of interactions that is at the basis of the way people make alliance, do business, and even make friends. 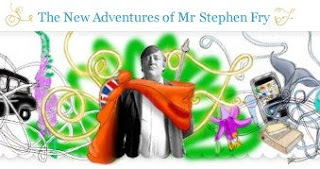 For the record, I don't think anybody's doing it better at the moment than the estimable Mr. Stephen Fry.